A 48-year-old biology schoolteacher and writer from Lyon, Alexis Jenni, won the renowned Goncourt Prize yesterday for his first novel, L’art français de la guerre (The French Art of War) published by Gallimard. Jenni said he never expected the book to be published much less win the Goncourt. L’art français de la guerre, which runs through 50 years of French military history, has been selling swiftly since it was published last August and had been on the shortlist for most of the prestigious French literary prizes this fall. Jenni was awarded the symbolic ten euros with the prize but winning the Goncourt usually ensures writers average sales of 400,000 copies of their book. 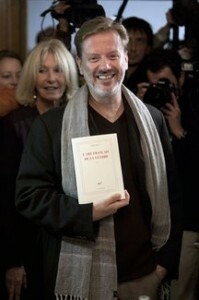 It’s uncommon for a first time novel to win the Goncourt although in 2006 Jonathan Littell’s Les Bienveillantes (The Kindly Ones), also published by Gallimard, won the prize. Until recently, Jenni, who has been writing for 20 years, considered himself a “Sunday writer.” He also has a blog where he posts drawings and short texts: Voyages pas très loin.